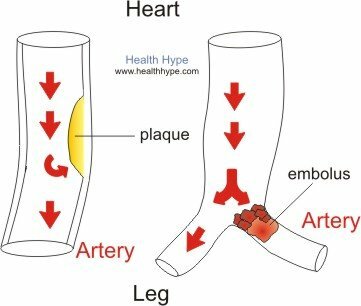 The legs, particularly the lower leg and foot, are the most prone to circulatory problems due to its distance from the heart and the range of disorders that may arise within the long and extensive network of leg arteries and leg veins. This can therefore affect the flow of blood from the heart to the legs via the arteries or from the legs to the heart via the veins. When the blood flow is hampered, it is essentially slowed down and may not reach the leg at a rate that is sufficient to maintain the oxygen and nutrient supply to the tissues of the lower leg or feet. This is seen in poor leg circulation problems affecting the arteries – arterial insufficiency. 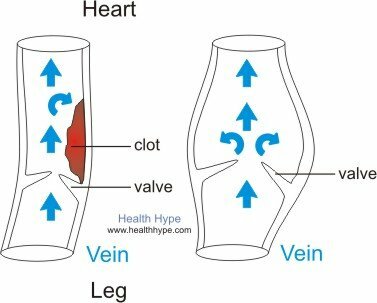 If the flow back to heart is disrupted, due to problems in the vein(s), the blood will pool in the legs and the circulation becomes sluggish. This is seen in venous insufficiency as a result of varicose veins, superficial thrombophlebitis or deep vein thrombosis. Valve incompetence (varicose veins) which affects the superficial leg veins. Clots (thrombus) which blocks either the superficial legs veins (superficial thrombophlebitis) or the deeper leg veins (deep vein thrombosis). Broadly, this is known as venous insufficiency. The signs and symptoms are discussed under Venous Stasis.